EXCLUSIVE HFP OFFER – Earn up to 10,000 bonus Avios with Kaligo.com hotel bookings! Head for Points and hotel booking site Kaligo.com, which awards Avios points with every hotel you book, are running an EXCLUSIVE promotion this month. The reason I’ve never used Kaligo is the way they describe rooms. You don’t know which room you are getting as they never match hotel descriptions – going for a non-chain hotel I’d rather use hotels.com. This has worked well for me. Needed one night in Battersea in a couple of weeks and as a new user it’s earned me 2500 avios. Yes it’s only a Travelodge but Kaligo was also marginally cheaper than the hotel site so this clearly works for some! Normally, use RocketMiles for my business stay. I visit Birmingham on business 1x night a week, and for a £100 prpn 3/4 Star hotel, I normally earn approx. 2,000 Avios a night. Kaligo noramly can not match this earning. The same stays on RocketMiles would earn me approx. 15,800 Avios so this bonus makes a real difference. Kaligo, you have a new customer!!! Thanks HFP! Obviously doing this you have to pay in full for your booking. What happens if Kaligo goes bust. Are they ATOL protected? Just curious as to what happens should it all go belly up, given I’d never heard of them until today. Booking by Credit Card would be the easy way to address these issues. You have standard Section 75 coverage via your credit card. They have been around for a few years and most of the airlines work with them – see the run of logos on their main home page: https://www.kaligo.com/ I’ve also met the top team both in London and in Singapore. We’ve never, ever, had any complaints about late or incorrect posting of Avios. Ive used them several times.. never had a problem, always get my avios soon as my stay is completed! In the example photo, how did they get Everyday Benefit 18,900 Avios / Total 28,900 Avios? 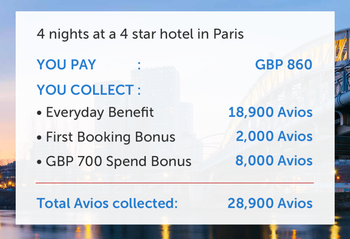 All the bookings I’ve looked at for around £750 have Rewards 3,600 Avios / Total 13,600 Avios. They have clearly picked the highest paying hotel in Paris as their example! IHG is now charging 35000 points at some of their HIX? Where has the world come to? Excellent news for a Marriott travel rewards redemption. I would also add, as per the article, that they have excellent customer service! Even if there was a price differential (forget the Avios), I’d pay a small difference for good customer service. It’s also a great way to top up miles currencies not widely available otherwise such is Krisflyer.